Sometimes, you start to feel really sick at inopportune moments. If it is late at night, over the weekend, or on a holiday, chances are good you won’t be able to get to see your regular physician. And when you’re feeling really sick but it’s not an actual emergency, it is definitely preferable to visit an urgent care center in your neighborhood than going to the hospital and waiting for hours to be seen. But beware that if you walk into that urgent care center sniffling, sneezing, and coughing, new research suggests that you may be walking out with an unnecessary prescription for antibiotics. The study, which was conducted by the Centers for Disease Control and Prevention in Atlanta, Georgia, and Pew Charitable Trusts in Philadelphia, Pennsylvania, found that urgent care centers are far more likely to prescribe antibiotics for viral infections that do not respond to this treatment compared to other health care facilities such as hospitals and doctors’ offices.1 These results are based on an analysis of medical records for patients who had symptoms of a cold, flu, or bronchitis and went to see a medical professional. By focusing solely on these three illnesses, the researchers were able to isolate instances where antibiotics should not have been prescribed—since they are ineffective for viral conditions such as these—but were anyway. After evaluating the data, the investigators discovered that a whopping 46 percent of patients presenting with symptoms of a cold, flu, or bronchitis were prescribed antibiotics at urgent care centers. In comparison, 24 percent of the subjects with those symptoms were prescribed antibiotics at emergency rooms, 17 percent at doctor’s offices, and 14 percent at retail clinics, such as those within pharmacies and supermarkets. These findings are concerning because urgent care centers have expanded their reach tremendously over the past few years. Ten or 15 years ago, it might have been difficult to find an urgent care within 20 miles of your home. However, by 2017, there were more than 8,000 urgent care centers around the United States, which was a jump of 12 percent over just the prior year. Obviously, this is not to say that the majority of physicians working at urgent care centers are less competent than their peers at hospitals, in private practice, or employed with a retail clinic. But perhaps the typically after hours nature of these visits, with patients who the need to see a doctor right away (remember, the name is “urgent” care), may result in doctors feeling pressure to prescribe something, anything, even useless antibiotics. After all, most patients are in the urgent care facility because they are truly feeling sick and expect the physician to prescribe something. But this is a huge problem, since antibiotics are only an effective treatment for bacterial infections. They are useless when it comes to viruses, and their overuse has contributed to the development of superbugs. Germs have mutated to the point where antibiotics that were once proficient at killing them off can no longer do the trick. Some of these antibiotic-resistant germs can lead to debilitating infections and even death. So, what do you do if you’re suffering from a bad upper respiratory infection, coughing incessantly, struggling to breathe through your nose, and feverish? Since the cause might be either bacterial or viral, seeing a doctor isn’t a bad idea. But if the examination leads to a diagnosis of a cold, flu, or viral bronchitis, don’t ask for or fill a prescription for antibiotics since they won’t help you at all. Instead, focus on natural remedies that can shorten the duration and lessen the severity of your illness. 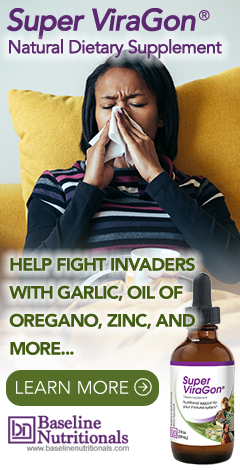 Try nasal irrigation to help remove mucous and clear your sinuses, take a teaspoon or two of honey for your cough, and use an antipathogenic formula that contains ginger, onion, garlic, and other powerful infection-fighting ingredients. These are much more effective methods for treating viral infections, and they don’t carry any of the risks associated with antibiotics. 1. Palms, Danielle L.; et al. "Comparison of Antibiotic Prescribing in Retail Clinics, Urgent Care Centers, Emergency Departments, and Traditional Ambulatory Care Settings in the United States." JAMA Internal Medicine. 16 July 2018. Accessed 25 July 2018. https://jamanetwork.com/journals/jamainternalmedicine/article-abstract/2687524. I hope you and Kristen are still happily married and both in excellent health. you lived probably north of Rinaldi in a nice community. You guys distribute anything to remove heavy metals from the body? I am sure you know that supposedly Fiji water is one of the healthiest waters to drink because the bottles have no bpa and the water has the highest percentage of silica of the top 3 which is excellent for removing heavy metals from the body! I am sure you know about the heavy metal war that takes place in our skies every day! Some Great Country, Huh!